Being total aquarium nerds, we love it when ocean life starts to permeate the other aspects of our lives, and this awesome sleeping back from ThinkGeek is the right product for that. Humorously called the Chumbuddy, this sleeping bag is designed to look just like a large shark, and guess what, you slide right into its mouth to play dead…err sleep. To expand on the possibilies for fun, the Chumbuddy is also a stuffed toy, which means you’ll get a little more playtime out of it other than just at night. The inside of the shark’s body measures a little more than 6.5 feet long, making it ideal for kids and grownups, and it will come in handy when the spouse banishes you from the bedroom for spending too much time and money on your aquarium. 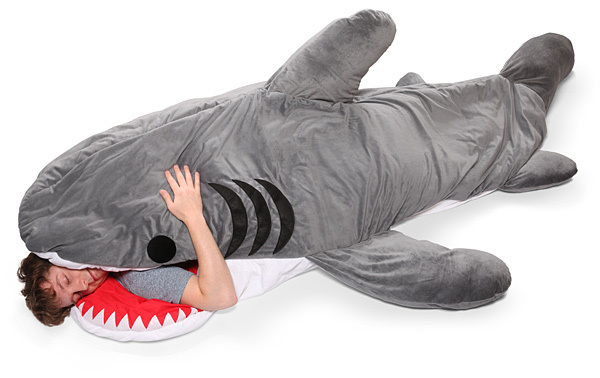 If sleeping in a shark doesn’t strike you as a fun activity, the Chumbuddy could also get some use as a cheesy movie prop or just for clowning around. The shark shaped sleeping bag runs about $200, which is a little pricey, but certainly well worth it for the novelty alone.